The first gene therapy drug approved by the European Regulatory Commission involves the transfer of a therapeutic gene to the muscle by adeno-associated viral vector (AAV). Now, muscle gene transfer is quickly becoming a therapy of choice for muscle and non-muscle diseases. 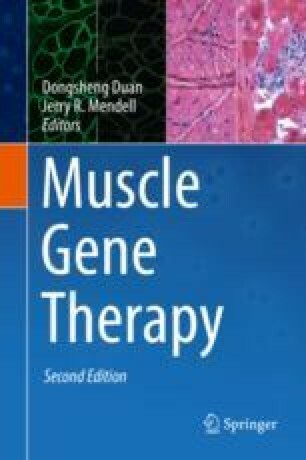 Successful muscle gene therapy requires efficient expression of therapeutic proteins in the muscle without causing any toxicity and side effects. To achieve this, the expression cassette of therapeutic proteins needs to be designed rationally. A typical expression cassette usually contains a promoter to initiate transcription, the coding sequence of a transgene, and a termination signal to terminate transcription. Other cis-regulatory elements can be added into the 5′- and 3′-untranslated regions. In this chapter, we review the development of the components of the expression cassette in the context of muscle gene therapy.